“The time comes in the life of a nation when there remain only two choices –submit or fight”. In 2005 Dr Garth Benneyworth (Sol Plaatje University) located a typed copy of Nelson Mandela’s original handwritten journal and notes in the National Archives of South Africa in Pretoria where it was stored in a closed collection. This is its first online publication by SA History Online. Herein may be a found a memory of the early years of the liberation and armed struggle anchored in the banning of the South African Communist Party(SACP) in 1950, the Sharpeville massacre in 1961 and the subsequent bannings of the African National Congress (ANC) and Pan African Congress (PAC). The wave of brutality and subjugation building on prior oppression unleashed by the apartheid state to bolster its power, created a situation where, in the words of Nelson Rolihlahla Mandela, the armed struggle became inevitable. Nelson Mandela, a co-founder of Umkonto we Sizwe (MK), the armed wing of the ANC, spearheaded the armed struggle against apartheid and colonialism in Southern Africa broadly, and in South Africa specifically. The country held its first democratic elections on 27 April 1994: a long walk and a long road on a journey only just begun. Nelson Mandela headed a nascent guerrilla army, one which on 16 December 1961 commenced a campaign of sabotage of state infrastructure and symbols of oppression. A deliberate policy decision was made not to attack targets whereby loss of life might occur. Having no military experience or training of his own, the Commander in Chief chose to undergo military training in a newly independent African country. In December 1961, the Pan-African Freedom Movement for East, Central and Southern Africa (PAFMECSA) invited the ANC to attend its February 1962 conference in Addis Ababa. On 3 January 1962 the Underground National Executive mandated Mandela and instructed him to visit Chief Luthuli, Secretary General of the ANC, to discuss the matter. His mission also had a broader purpose; he was to arrange political and economic support and military training for MK in as many countries as possible. Mandela was to link up with the External Mission headed by Oliver Tambo and explain the strategic shift of the ANC. Mandela kept a journal during this 1962 mission. The journey begins with his first entry at 11am on 3 January 1962 and his last in Ethiopia on 13 July 1962 shortly before his return to South Africa. A key record in the archive of South Africa’s liberation and armed struggle and is also a testament of the universal struggle for human rights against oppression and tyranny. It offers a reflection into an era of newly independent African states and those still engaged in an armed struggle for independence. The alignment of forces against colonialism and apartheid South Africa emerges as one of the main themes in Mandela’s writings. On a personal level, this was Mandela’s first journey beyond the borders of his own country. On 11 January 1962 he entered British controlled Bechuanaland and from there flew to Tanganyika and on to Addis Ababa and the PAFMECSA conference which he addressed, with Oliver Tambo, as part of the ANC delegation. Mandela wrote a substantial amount of detail in his journal that dealt with military matters. While fascinating in its own right it stands as a poignant record relevant to the memory and archive of that era. In matters military, Ethiopia was the first point of contact. Mandela’s notes reflect whom he met with where, and how tangible military support was going to be raised and provided. Linking up with Algeria’s National Liberation Front (Front de Liberation Nationale (FLN)) in Morocco proved a key experience. It was at Zegangan Training Base in former Spanish Morocco that Mandela first fired military weapons. Strategically however the FLN imparted much knowledge from their lived experience. Specifically that the purpose of armed struggle should not be about overthrowing the apartheid government by force. Rather it should be about the ANC using this tactic to unleash broader political forces thus forcing the government to the negotiating table. In the context of the negotiated settlement culminating in the 1994 democratic elections, this proved to be sage advice. From Morocco, Mandela travelled to Mali, Senegal, Sierra Leone, Liberia and Ghana, where he raised funds and garnered support. He then visited London for ten days before arriving in Addis Ababa on 26 June 1962 to undergo six months military training. This was cut short during July 1962 when the ANC requested his urgent return to South Africa. And it is there, after diarising his training, his skill at arms and the strategic and tactical principles that he acquired on the live firing ranges and the classrooms of the Ethiopian Army, that this journal ends. At dawn on 24 July 1962. Mandela arrived at Liliesleaf. During his mission, rumours circulated that he had changed his politics, even that he had switched to an African Nationalist paradigm. The PAC claimed that he had joined them. Mandela therefore saw as his first duty to brief the leadership at Liliesleaf on his mission. 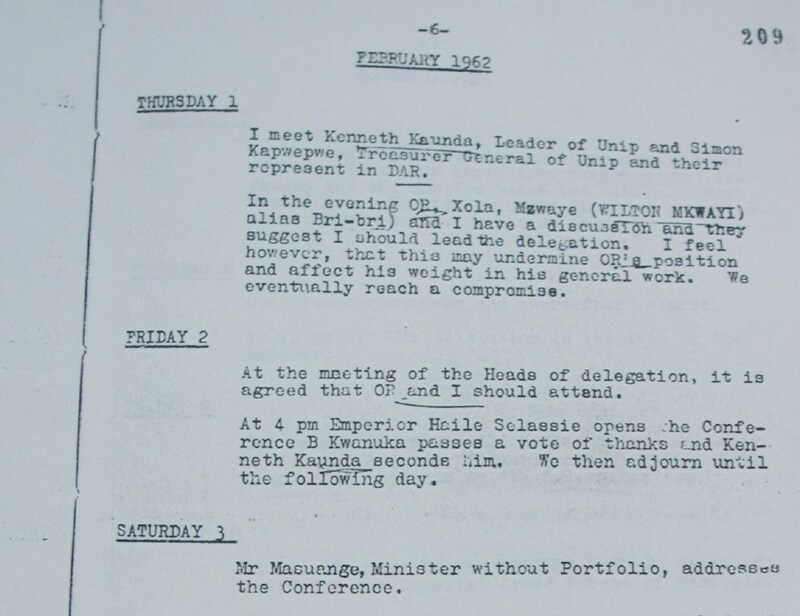 Thereafter he would brief Chief Luthuli, and other organisations that formed part of the alliance that had become perturbed during his absence. During the night of 25 June 1962 Mandela briefed the leadership using this diary and other notes as his reference. After a general overview of his travels, an itemised report of funds received and the offers of military training, Mandela reported in detail the reservations he had encountered about the ANC’s co-operation with white and Indian South Africans and in particular communists. From his recent experience in Africa, he proposed reshaping the Congress Alliance to position the ANC as its clear leader, particularly around issues affecting Africans; a fundamental policy shift. Yet one that was evolving and adapting to the shifting realities of post-colonial Africa, a realignment of forces that emerged into a political, economic, social and military struggle to liberate South Africa. Mandela left this journal at Liliesleaf when he traveled to Natal where he was soon captured by South Africa’s security forces. It was crucial that this incriminating evidence be destroyed. Mandela relayed two messages to this effect, through advocates Joe Slovo and Bob Hepple, asking that they get rid of the documents. They made enquiries and later reported back to Mandela that his instruction was carried out. Yet it wasn’t. During the police raid on Liliesleaf this archive was uncovered amongst other incriminating writings. It formed part of the state’s body of evidence during the Rivonia trial. Mandela read his famous statement from the dock, negating the need for the diary being entered into evidence as he was not subject to cross examination. It remains however an indelible record of a past era one: that is fundamental to our knowledge of and understanding of that space and time. Click here to open in new tab.